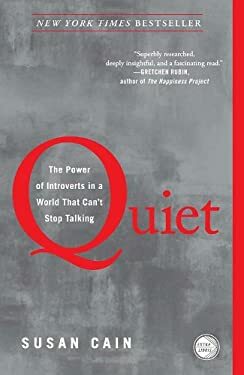 Passionately argued, impressively researched, and filled with indelible stories of real people, "Quiet "shows how dramatically we undervalue introverts, and how much we lose in doing so. Taking the reader on a journey from Dale Carnegie's birthplace to Harvard Business School, from a Tony Robbins seminar to an evangelical megachurch, Susan Cain charts the rise of the Extrovert Ideal in the twentieth century and explores its far-reaching effects. She talks to Asian-American students who feel alienated from the brash, backslapping atmosphere of American schools. She questions the dominant values of American business culture, where forced collaboration can stand in the way of innovation, and where the leadership potential of introverts is often overlooked. And she draws on cutting-edge research in psychology and neuroscience to reveal the surprising differences between extroverts and introverts. New (490 available) BRAND NEW. Over 1.5 million happy customers. 100% money-back guarantee. Make your purchase count: support Better World Books' worldwide literacy partners.